Laundry is my favorite household chore. Other than the smell of a clean baby or my baby's breath, the smell of clean laundry is one of my favorite scents. Some call me crazy. Some people get it. But I would rather do laundry all day than anything other household chore. Well, except whites. I really dislike folding whites. Too many socks to match and too many of my husband's white t-shirts to fold. I don't have a "laundry day" per say. I just do a load as a full one accumulates. I sort my loads this way- lights (just our clothes), darks (just our clothes), baby girl's clothes & things, towels (kicthen & bath), and whites (anything that needs bleached). At my wit's end with how many adorable baby outfits were being stained and ruined by my baby girl's pooplosions, I turned to my Twitter and this was recommended to me. And it works! Any mama who has breastfed knows, boobie milk poop stains are THE WORST. But I just pour a little of this in the sink with warm water, throw in the soiled onesie, and wring it out at the end of day letting it dry as much as possible, and then throw it in with her other clothes when I have enough for a load. 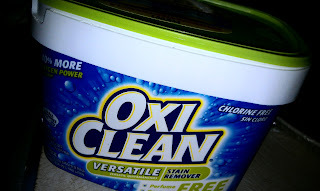 I have had not a single stain on any of her clothes since starting to use this. I've always heard good things about oxi clean and I think I'll have to try it. I love Oxiclean too, however, JUST this morning I got a chemical "burn" (very mild actually) on four of my fingers from the triple strength liquid form of Oxiclean. All happened in less than two min., so be cautious with the liquid on your fingers. I wish I lived in a state that allowed for good weather to do dry lining.